Receiving a facial that reveals glowing, radiant skin is one of the most luxurious and elegant feelings in the world, and now you don’t have to wait for your next spa appointment to pamper yourself. The Zinfandel Illuminating Petal-Peel System is a multi-step facial mask that you can use at home to get professional results. Roses are known for their beauty and fragrance, but roses also contain impressive skin benefits and the Zinfandel Illuminating Petal-Peel System uses the power of roses to benefit your skin. Evening primrose oil has been used for centuries for its intense anti-inflammatory and healing properties and is contained in the Correcting Petal-Peel Capsules used in this system. Rose bud powder found in the Rose-veratrol Petal-Peel Powder enhances the silky feeling on this glow-revealing powder. Diatomite provides a very gentle exfoliation for your skin while collagen helps smooth out fine lines and wrinkles, giving your skin a younger appearance. Together, the prestigious ingredient list works to help reveal a more even looking skin tone and a more radiant complexion. Because peel-off masks adhere more effectively to skin that has been cleansed and exfoliated, apply the Zinfandel Illuminating Pre-Mask to your skin and massage this into your skin for one minute. Use a hot cloth to remove the pre-mask and begin the process of applying the Resveratrol Illuminating Petal-Peel System. Tear open one of each of the Rose-veratrol Petal-Peel Powder, Activating Petal-Peel Gel and Correcting Petal-Peel Capsules. Pour these items into the provided mixing bowl and mix using the provided spoon until you reach the consistency of a creamy past. Avoiding the eye and mouth areas, apply a generous, but even layer of the mask to your face and neck using the mixing spoon. Leave on for 20 minutes, or until the product solidifies. Once the product is ready, gently peel the mask off beginning on the outside and peeling off towards the center of the face, then repeat on the other side. Peel product off of your chin and rinse your face with warm water to remove any residue that may remain. For best results, follow with the Zinfandel Skin Tone Correcting Serum. 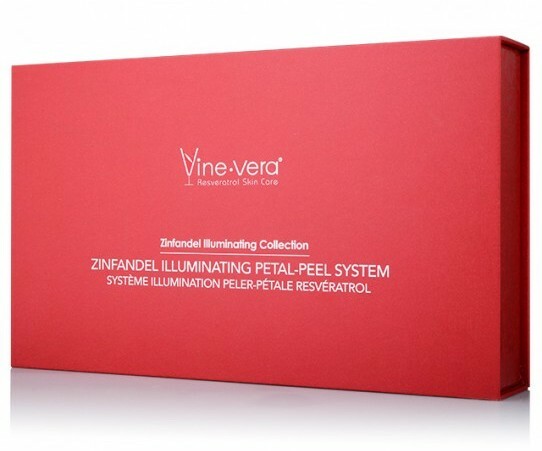 The Zinfandel Illuminating Petal-Peel System is far more than a face mask, it is an indulgent experience that results in more even, luminous skin.